One of the things that I enjoy most about being a local resident along 30-A are the holiday events that ocurr during the month of December. 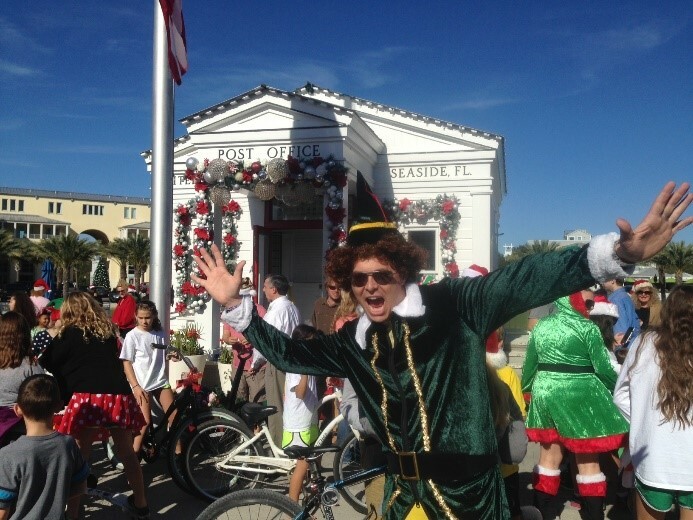 Christmas on 30-A is truly a “Norman Rockwell” type environment, where multiple generations of both locals and visitors enjoy beautiful sunsets, fantastic restaurants, and the down to earth lifestyle of living on Florida’s Emerald Coast. Visitors and Locals alike have no shortage of activities to engage in while visiting Seaside, Rosemary Beach, Alys Beach, WaterColor or any of the beach villages along Scenic Highway 30-A. What to do on 30-A during the holidays? Having 3 small children, the Elf Ride in Seaside is one of the biggest hits on our household each year. Kids and Adults decorate golf carts, bikes, scooters, long boards, etc. while riding along 30-A through Seaside. You don’t want to miss this event! This event will feature commissioned paper lanterns in the shapes of iconic symbols of the holiday season. Groups can participate by making their own paper lanterns. Following the 12 Nights of Lights light show, enjoy a showing of holiday movie classic, ELF under the stars at 7:15pm. Bring your blankets and chairs for an evening of fun for the entire family! Admission is Free and everyone is welcome! As a local, we rarely miss opportunities to spend time as a family listening to concerts, Pensacola Symphony Orchestra performing under the stars. Bring your lawn chairs and blankets and allow the sounds of the season to remind you of all the magic of the holidays. The Winter Solstice Run is an all-day ultra-run, starting at sunrise, continuing 40 miles along the beaches, around the many lakes of South Walton, and through Florida state forests until sunset. This is all about fun, adventure and camaraderie – it’s not a race! It also has transpired to training for Run Across Ethiopia and Run Across Palestine participants. The annual runs have occurred during both the summer and winter solstices, ranging from 30-40 miles during the shortest days and shortest nights of the year. For some this will be the first of their Solstice Runs, for others it may be their 6th! This will be one of the most amazing life experiences you have, join us and together we will make a difference for women in the DR Congo! There are only 100 spots this year so don’t wait to sign-up! A family favorite of ours, the Fonville Press is showing holiday movie classic, ELF, on December 29th at 5:15pm. Bring blankets and low back chairs for a fun family evening set to the backdrop of the comedy starring Will Farrell. Fonville Press will offer hot drinks and snacks. Experience a spectacular, family friendly party including live entertainment from the Dirty Guv’nahs and MamaDear, along with kid’s art projects, street performers and a memorable fireworks finale at midnight. So whatever activities and events that you and your family choose to attend along 30-A during the holidays, you will not be disappointed with your choices.